"... I decided to spend the big bucks and start with this product on the advice of some others. I am happy I did as it is pretty damn good and compared to the other brands out there very good. The flavor is great and doesn't upset my stomach either. Only gripe I would have would be the price.. I wish it was a bit lower. But there are always discounts popping up so if you look you can get a fairly good deal." "... Started using this a few weeks ago as it was highly recommened from a close friend who knows Hany. I found it has really helped with recovery times and strength is actually improving from one workout to the next as well.. I am going to assume that it is from the recovery improvements. Taste is good and goes down really easy with ICE cold water. Really impressed and will try to add the Evp product to the mix as well." "... Just placed my order through this site.. 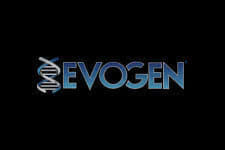 I am already using evogen EVP with really good results so I am anxious to throw this into the mix! Will be posting regular updates on this stack!" "... From what I have heard.. cell kem is out the latest at the Olympia for the grand reveal. If it's anything as good as the evp product which I am using now for 4 months, I will be using it for sure!" Evogen - CELL K.E.M. Post-Workout .. NEW! Hany Rambod Has Guided Many of the Top Professionals & Amateurs to Success and Rewards! 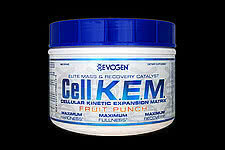 Evogen, created by Hany Rambod has taken the leap into post workout nutrition with CELL KEM! Following on the footsteps of the incredible success of their pre-workout sensation, EVP, Evogen has created an ideal post-workout formula that will truly propel your post workout growth and recovery to new levels. CELL KEM is a recovery powder that you can stack with EVP (the pre-workout powder) to really get the most out of each and every workout - it's that simple. Take advantage of the key, yet very short time frames before and after your training sessions where your body will soak up and actually use they key ingredients it requires to progress that only EVP and CELL KEM contains. Hany is perhaps the top trainer or guru when it comes to competition prep - with many 1st place champions and his unique fst-7 training methods - he truly has a grasp on what it takes to create and become an elite athlete. The results speak for themselves, and as is seen with the power of EVP, there is no doubt CELL KEM will follow with the same success. 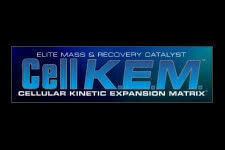 Evogen CELL KEM is the Genuine Elite Mass & Recovery Catalyst! Combined with Evogen EVP .. CELL KEM Completes the #1 Stack!